vACC Switzerland is pleased to announce the one and only original VA-Meeting 2018. 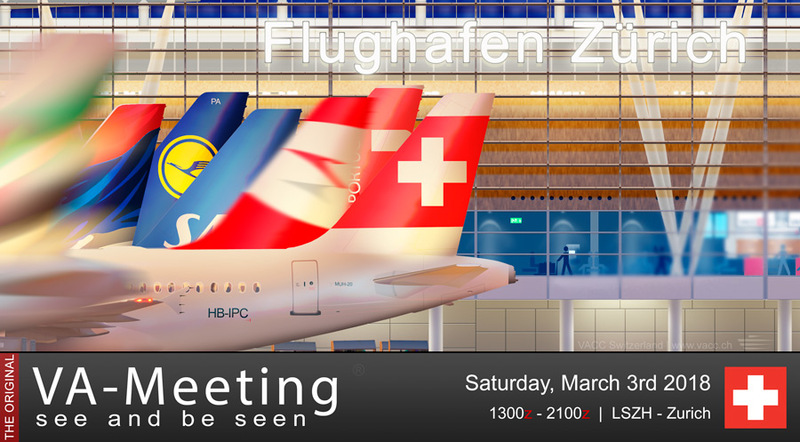 We invite you to our major airport Zurich (LSZH) on 3 March 2018, to participate in the biggest virtual flight event we provide, and which might be the biggest VA event on VATSIM. Mark this date in your calendar so you won't miss it! Since 2007, this yearly event has become tradition and we are happy to offer you fully staffed airports again this year. However, not only Swiss controllers will be online. Our neighbours will support us to manage the massive traffic as well. Additionally, we will present you with partner airports you can fly to and from. You can expect full ATC coverage over the heart of Europe. If you would like to experience a congested airspace over Zurich, make sure your VA participates in this huge event. We will find an appropriate gate or stand for each of you at Switzerland’s busiest airport. Please notice that all traffic in and out of Zurich will need a slot during the event (except VFR). Visit now the event homepage and stay tuned on http://vameeting.vacc.ch! The event team looks forward to see you at the original VA-Meeting on 3 March! Das Slot Booking ist seit Freitag offen! Reserviert jetzt euren An-/Abflug ans VA-Meeting 2018! Get together and be seen at Zurich Airport.